We recently had the opportunity to stay at Suites Club de Golf while in Acapulco. When you think Acapulco, most visitors think of the beachfront hotels. 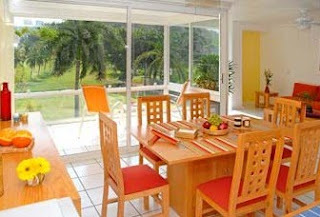 Well Acapulco offers many other types of accommodations and Suites Club de Golf meets that criteria. Located across the main drag (Ave. Costera) from the beach and up a small street, these 8 suites overlook the Acapulco Golf Club. 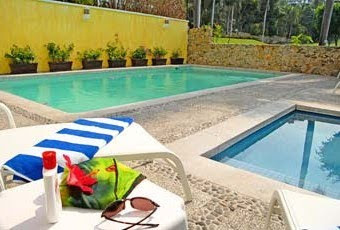 A private entry with parking is encountered first, then a medium-sized pool with a view of one of the holes. Perfect for lounging around. The tower's elevator leads to eight spacious suites which can sleep up to 6 guests. Each suite has a kitchen, dining area, living room, two bathrooms and a balcony with the aforementioned views of the golf course and Acapulco's high-rise hotels. On the top floor is a palapa-covered common area with commanding views. The beach is only a couple blocks away.